My Tarot, Psychic & Medium Readings are meant to empower my clients and give new insights that should inspire introspection, exploration and speculation about their lives! It is VERY important to know that I do not predict the future in my readings, as it is my belief that free will, circumstance and your own good sense will ultimately shape your future! What I CAN do is guide you to see the possible outcome of the situation that you bring to the table, give you affirmation and clarity. I do so in an uplifting, friendly and supportive way that should leave you energized about your life's path! Tarot is not a substitute for professional counseling, medical or legal advice or your own common sense. Think of Tarot as an addition to your healthy life choices as well as a fun and entertaining bonus in your life! ALL who come to me for Readings can be assured of COMPLETE confidentiality. Your Reading, questions, spread and answers are shown to NO ONE else and never discussed outside the confines of our session! What is my background? I have been reading Tarot for well over a decade. In addition to Tarot, I can provide 'straight' Psychic Readings as well as evidential Medium Sessions (giving proof that I am speaking with those who have passed and are in Spirit). I am Psychic and an Empathic (which means that I can easily feel your spiritual vibrations, emotions, energy and personal history) and Intuitive (which means that I can sense what cannot be felt though the usual 5 senses). I am also Clairvoyant (clear seeing), Clairaudient (clear hearing) and Clairsentient (clear feeling). I offer Tarot Reading and I also offer holistic Energy services such as Reiki, Chakra Cleaning/Tuning and Balancing and Dance Meditation classes. I also offer classes & workshops in Reading Tarot Cards and Guided Meditation Sessions. 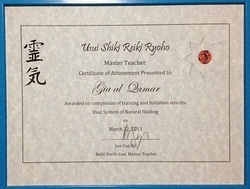 I am a Certified Reiki Master and Teacher by The Montclair Metaphysical School from which I also hold Certification as a Psychic and a Medium. I am also a Minister ordained through the Universal Life Church. And...My accuracy rate is very high! The following link has a number of testimonials from happy clients! Please take a moment to read! Mediumship workshop, international teaching Medium Tony Stockwell, The Journey Within Spiritualist National Union Church, Pompton Lakes, NJ. Essential Aspects of Mediumship, Internationally teaching Medium Mavis Pittilla, The Journey Within Spiritualist National Union Church, Pompton Lakes, NJ.